Source4Style and the IOU Project are holding a sustainable design competition to find the next designer for the IOU Project’s “Made in NYC” capsule collection. 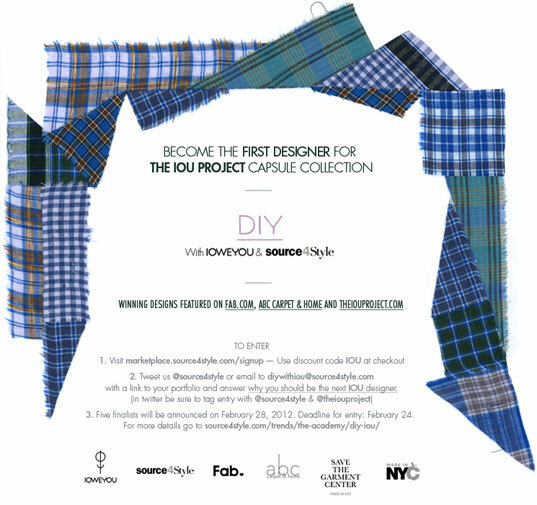 The competition, “DIY With IOU,” is open to designers around the world. Designers of all levels can enter on Source4Style’s site from February 1 to 24, 2012. The entry fee is $100 and includes an annual Premium Level membership, normally priced at $350, on Source4Style. (You can sign up and use discount code IOU at checkout.) Premium Level members for Source4Style can enter for free. Once a member, designers can submit their portfolio for consideration via Source4Style’s Twitter account or via email. Five finalists will be chosen on February 28, 2012 by a panel of judges including, Benita Singh and Summer Rayne Oakes (co-founders, Source4Style), Kavita Parmar (designer, The IOU Project), Vivian Weng (director of fashion, Fab.com), Alysia Reiner (actress), Izabella Miko (actress), VV Brown (singer/songwriter), Erica Domesek (founder, P.S. I Made This), Kate Dillon (model) and Erica Wolf (Save the Garment Center). The finalists will then receive 8 meters of unique and traceable madras cotton from IOU to produce a single garment or accessory for women, men, or unisex for Spring/Summer 2013. The winning product from DIY with IOU, announced on March 29, 2012, will be produced as part of the IOU Project’s “Made in NYC” capsule collection, showcased at a trunk show hosted by ABC Carpet & Home, and sold on Fab.com. Profits from the sale of the design will be shared with the winning designer. Source4Style and the IOU Project are holding a sustainable design competition to find the next designer for the IOU Project's �Made in NYC� capsule collection.